Fairbanks, Alaska (AK) – Fairbanks’ renowned aurora borealis viewing lures people from all over the world during the “Aurora Season” from August 21 to April 21. Fairbanks’ location is ideal for northern lights viewing because it is under the “Auroral Oval,” a ring-shaped zone over the far north where aurora activity is concentrated. Additionally, Fairbanks’ low precipitation and distance from coastal areas contributes to consistently clear nights. All combined these variables make the Fairbanks region an outstanding destination for possible aurora borealis viewing. Fairbanks is frequently referred to as the best place to see the northern lights in Alaska, the United States and in many cases, across the globe. National Geographic Magazine says that “Fairbanks is the best place in the U.S. to take in the northern lights,” CNN says “The city of Fairbanks, in Alaska, is often cited as the best place to see the Northern Lights in the United States” and Travel + Leisure and Smithsonian Magazines both call Fairbanks the best place to view the northern lights in the U.S. The University of Alaska Geophysical Institute located in Fairbanks conducts extensive research on the northern lights and offers daily aurora borealis forecasts. Aurora intensity varies daily, with the best displays from late evening to early morning hours. The aurora will be visible in Fairbanks an average of four of five nights when the sky is clear and dark enough. Visitors who stay a minimum of three nights and are actively out during the late evening hours increase their chance of seeing the aurora to more than 90 percent. There are many different ways for visitors to hunt for the aurora in Fairbanks. They can drive to a nearby vantage point and wait for them to appear, view them from a heated “aurorium” cabin or lodge away from the city, see them on a dog sled adventure, or even from a tour further north above the Arctic Circle. Many hotels in Fairbanks offer a wake-up call to alert guests when the lights are out. Once visitors have spotted the aurora, they can stop by the Morris Thompson Cultural and Visitors Center in downtown Fairbanks for a personalized aurora certificate. 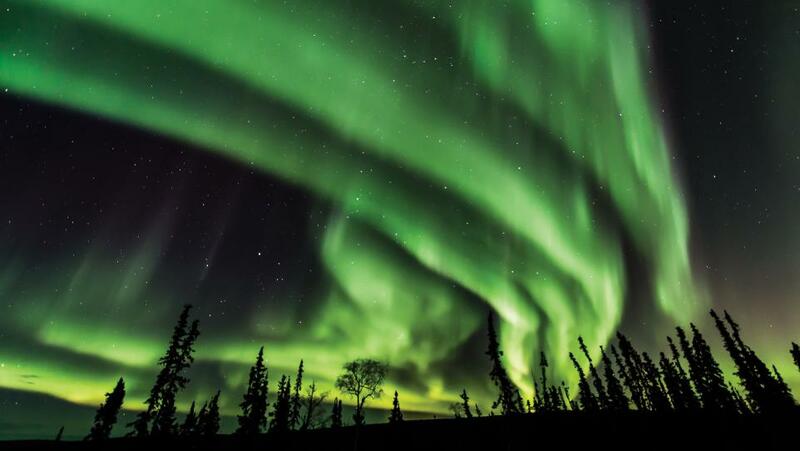 There are no absolute guarantees but their chances of seeing a great light show are better in Fairbanks, Alaska. For more information, please visit www.explorefairbanks.com.